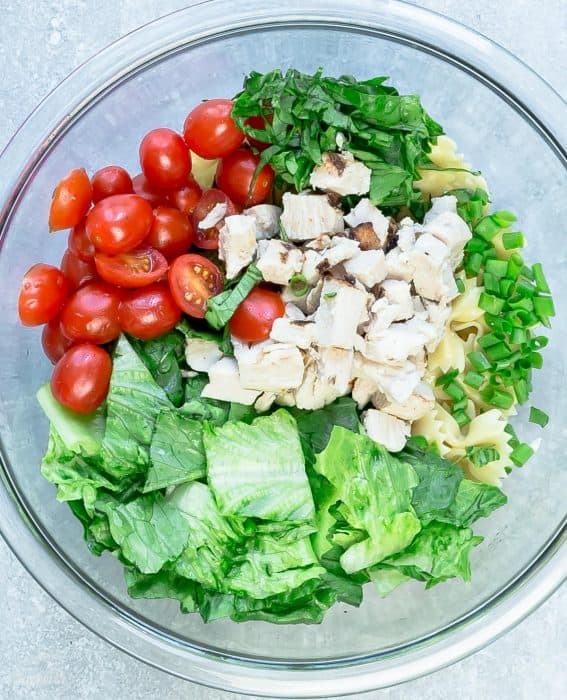 Chicken Caesar Pasta Salad is an easy side dish with all the flavors in a classic Caesar salad. 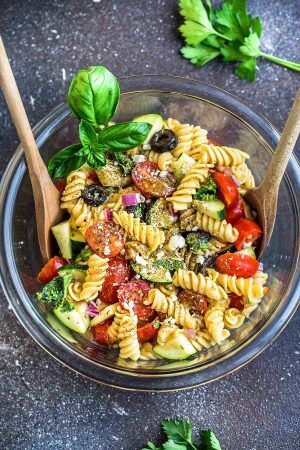 Best of all, with a lightened up mayo-free dressing and ready in less than 30 minutes! Perfect for summer potlucks, barbecues and cookouts. Plus recipe video. 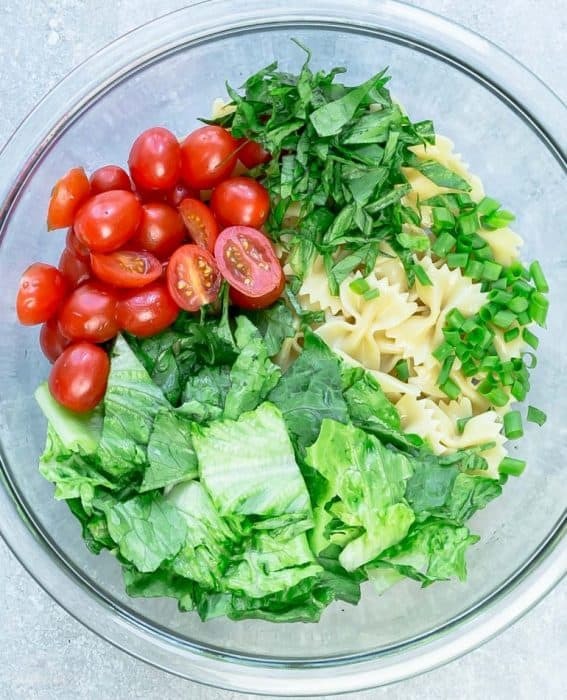 With summer just around the corner, pasta salads have already been happening a lot around here lately. They are super versatile and perfect for packing along to potlucks, picnics and cookouts. 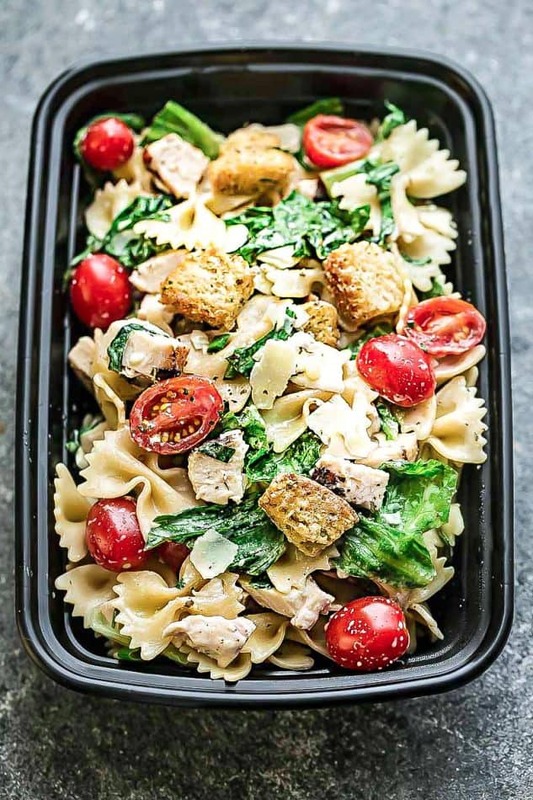 A few of our favorites include: Caprese, Greek Tortellini, Broccoli Pasta Salad, Italian Pasta Salad and this Chicken Caesar Pasta Salad. It’s a simple side dish that comes together in under 30 minutes. I shared it back in 2015 and thought it was time to give the photos a facelift as well as republish the post for any new set of eyes. 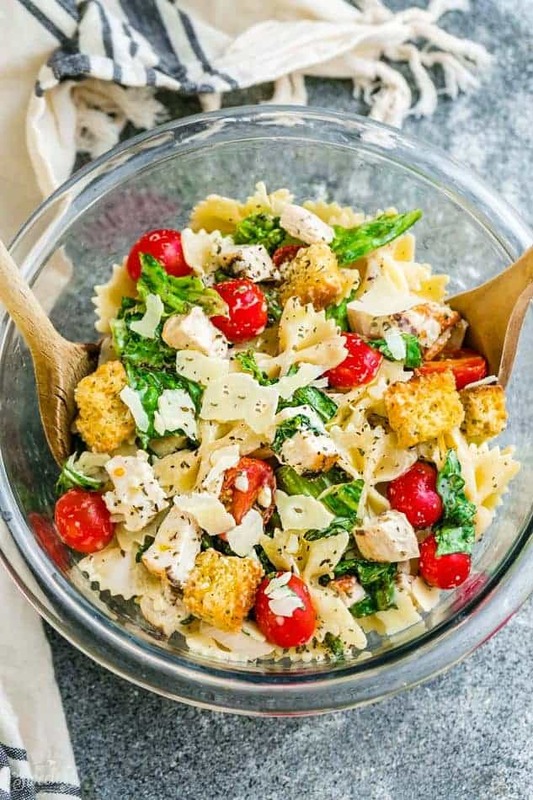 My husband is a big Caesar salad fan and the addition of pasta and chicken help to make this a heartier side dish or alone as a complete meal. 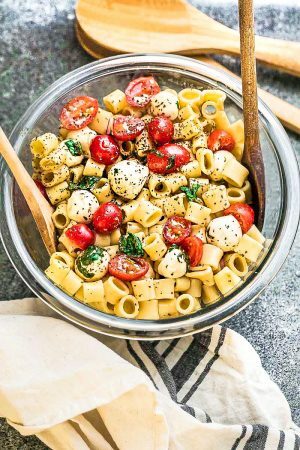 I used bow-tie pasta here but feel free to swap with penne or any other pasta you like.Whole wheat or gluten free would both work great here as well. To keep this entirely gluten free, you can leave out the croutons or make your own croutons using gluten free bread. 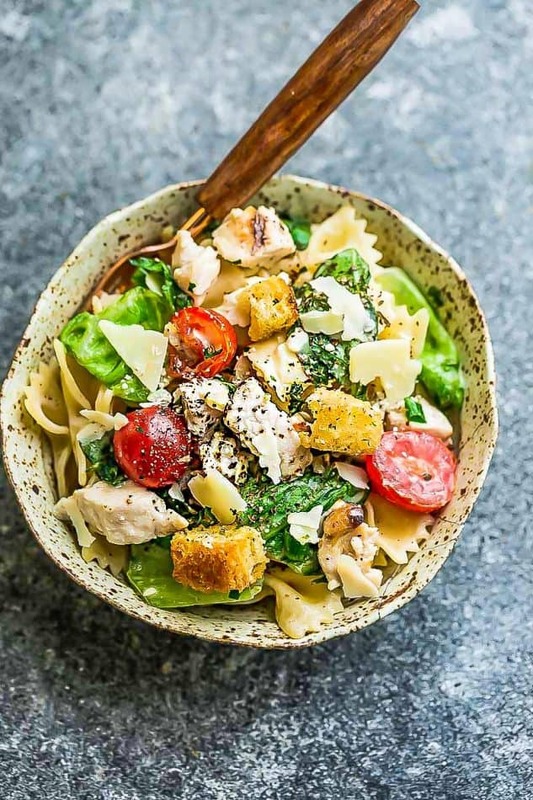 You can use your favorite Caesar dressing here but if you have a few extra minutes, the homemade dressing will be well worth the effort. 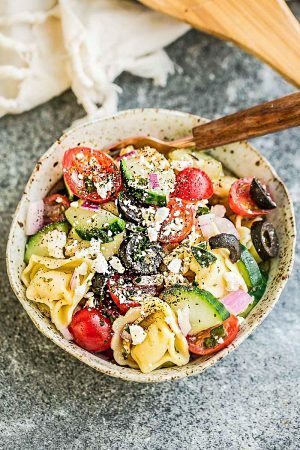 It’s lightened up with Greek yogurt in place of mayo and blended it up with a few essential ingredients to create that popular signature Caesar flavor. A healthy mayo-free homemade Caesar dressing with the same creamy and decadent effect. Finally, toss in some grilled or rotisserie chicken for a complete meal. Or keep it meatless with chopped nuts or roasted chickpeas instead. 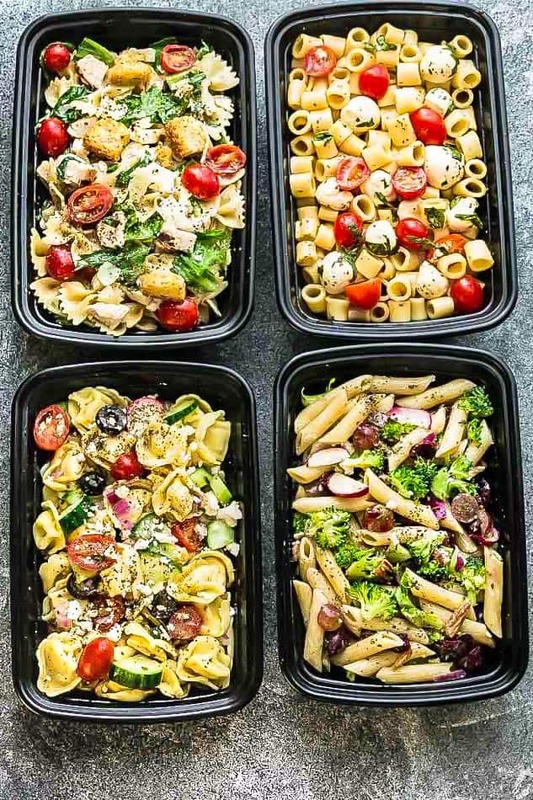 for Sunday Meal prep, divide the pasta salad into lunchboxes. 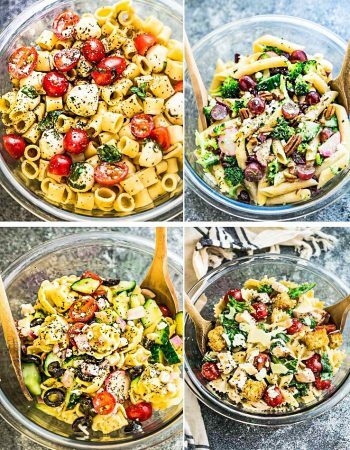 Or make all four pasta salads and bring a different one to work every day. 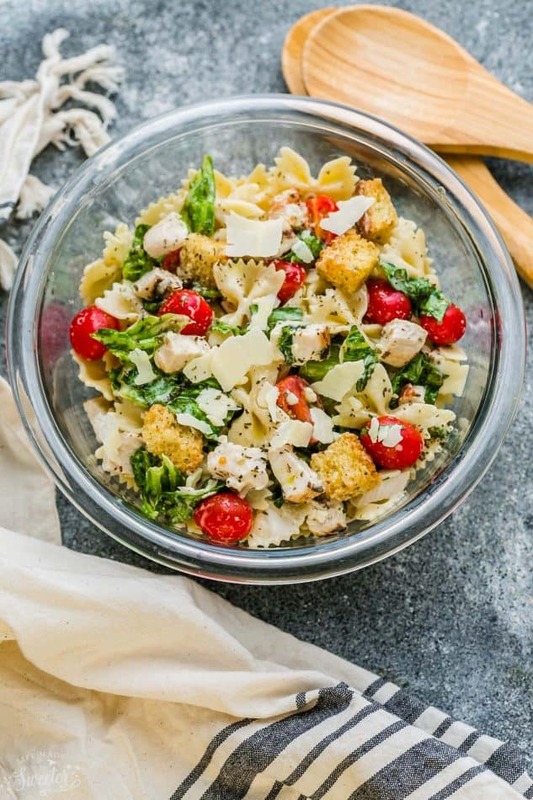 Chicken Caesar Pasta Salad is an easy side dish with all the flavors in a classic Caesar salad. 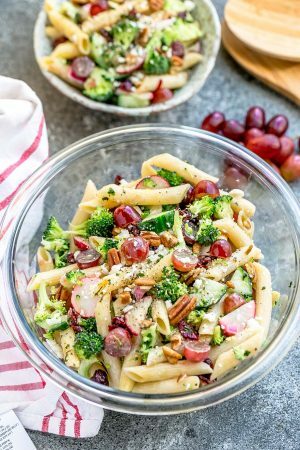 It's lightened up and ready in less than 30 minutes and is perfect for summer potlucks, barbecues and cookouts.